CCA Kids Blog: What a Smile! Peter’s only had braces for about six months, and I’m stunned at the change in his smile. The before and after pictures pretty much say it all… A-M-A-Z-I-N-G! Although he has complained plenty about having the braces put on, I know they’ve made a positive difference for his self-image. Two years ago when I spoke to Peter’s class about facial differences, I opened the conversation by asking the students what they noticed about Peter. The first student did not mention his ear, trach stoma, or feeding tube as I was prepared to address. The first comment was about how Peter’s teeth looked different. This was third grade, which is getting past the point of cute gaping holes with missing front teeth. This is the age when permanent teeth come in and you really start to see how your child’s smile is going to look. At that time, Peter’s two front teeth were far apart, and he had a severe overbite (typical of Goldenhar kids). So, yes, his teeth were different. My concern over the question was not that it had been asked but rather how Peter felt about his appearance. Fortunately, I was able to make a quick segue into how Peter had oral surgery just a few months earlier to extract several impacted teeth in preparation for getting braces. Little did I know it would be one more surgery, many consults, and two years later before he would finally get braces. I admit I was overwhelmed with how to find the right orthodontist and how much cost and time would be involved. The thought of driving an hour for appointments at our Children’s Hospital was not at all appealing to me. I was also less than thrilled with the clinic environment. Still, I didn’t want to select an orthodontist just because the office was nice and closer to home. My main concern was finding a doctor with an experienced craniofacial background. After consults with three different orthodontists, I made the decision to go with the doctor who was less experienced with craniofacial kids. This was a risk I took only after having an open and honest conversation with her about my concerns. Only then did I feel comfortable enough to offer her a "Team Peter” membership. Peter used to talk about his “Beaver Teeth”. He would make the remarks jokingly, but I know he was bothered by the way he looked. I’m so relieved this was a relatively easy and painless “fix” compared to most issues we have to address with his medical care. His smile clearly shows the difference straight teeth can make. 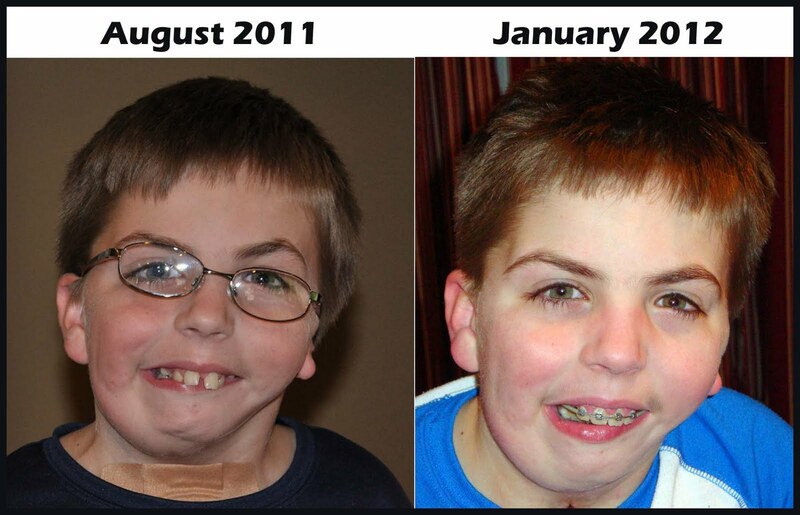 UPDATE to post... Peter's braces were removed in February 2013. Read our follow up post here Breaking Free of the Braces! Beautiful smile! Not to mention those beautiful eyes! I wish I had those eyes! Great smile!!! thanks for sharing... we are in the process of trying to get the insurance companies to pay for my son to get braces. A new adventure for us.